I must start this with letting you know that I am in our room in Albuquerque, sitting by the big front window with a gin & tonic looking at the beautiful Sandia Mountains Life is grand. This morning we got up when we wanted. No alarm going off at 3:30 today. Before we left we had breakfast at Kranberries, the restaurant behind the hotel. 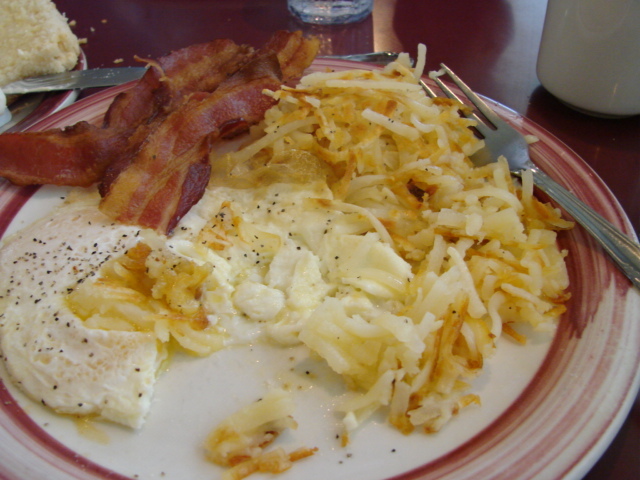 I had two eggs over easy, bacon and hash browns with a buttermilk biscuit. I wasn’t going to take a picture of my breakfast but I was struck at first bite that it was not greasy, so I had to take a picture as living proof. It was really, really, good. 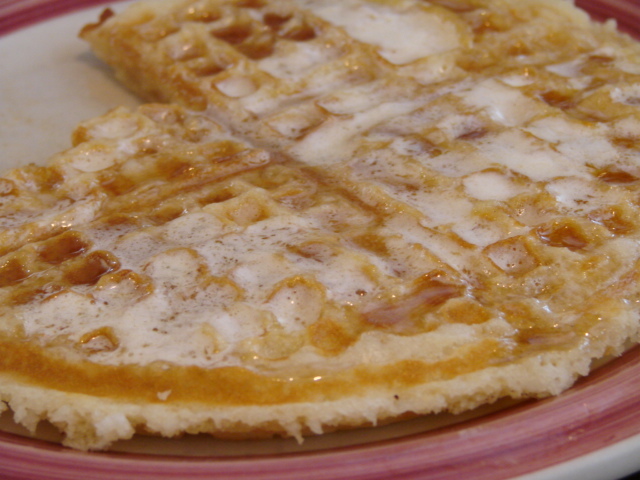 Stan had a waffle, not the Belgium type, just a regular ol’ waffle that was delicious. 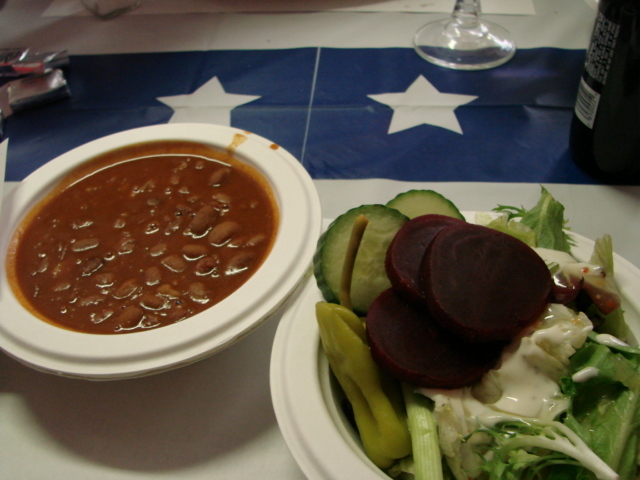 So If you ever find yourself in Lordsburg New Mexico, eat at Kranberries. Hatch was a hoot!! I love that little town. It has a comfortable feel to it. One woman I was talking to summed it up in one Spanish word, tranquillo. (tranquil) I had my first “typical tourist” attack here. We were entering the town and I saw a house with ristas lining the fence, a sight I haven’t seen in many years. I screeched on the brakes and pulled off the road so fast Stan thought something was wrong. We both said tourist at the same time. This is soooo New Mexico. 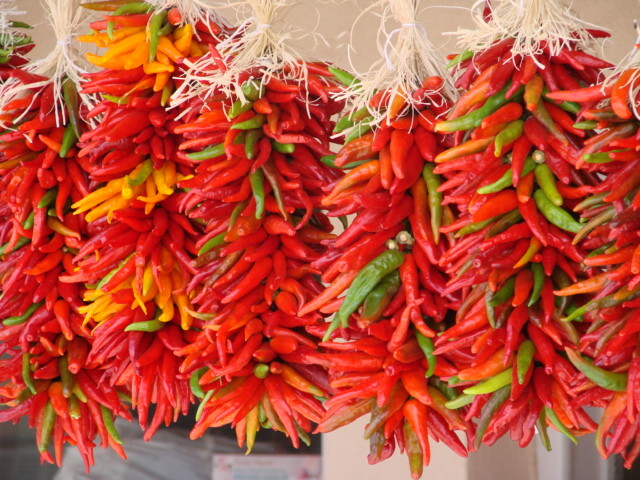 I stopped at a little roadside stand and bought some chiles. I got a plastic grocery bag full of chiles for $3.00. I bought a bag of medium and a bag of hot and a little bag of dried ground up jalapenos. I’m telling you, our room smells so good. 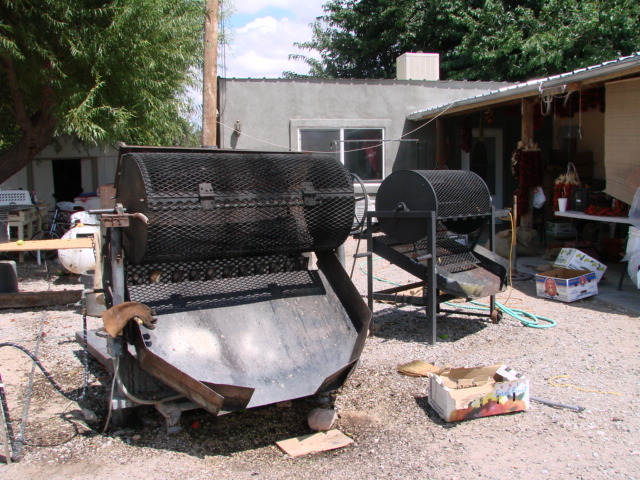 These are the roasters that are set up all over New Mexico now. 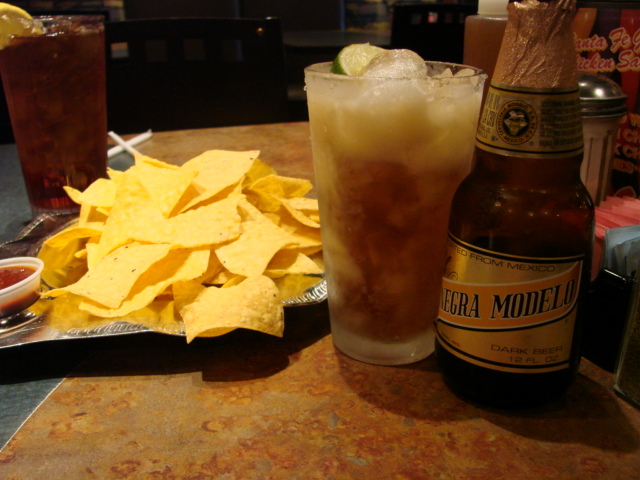 Once we arrived in Albuquerque we were going out for what would be our first New Mexico, Mexican food dinner, or so we thought. 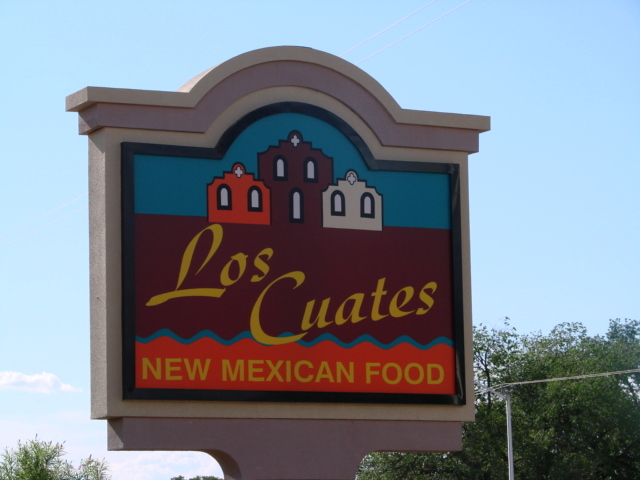 The hotel staff recommended a place called Los Cuates. Look at this sign very, very good. Add this to your list right after The Flying J as places NOT to go. Ya know, whenever I don’t follow my first instinct I regret it. First, the restaurant looked touristy to me. It has a typical Mexican food restaurant facade. It reminded me of the chain El Torrito. We walk in the restaurant and the first smell that hits me is Desitin (sp) ointment. I haven’t used Desitin since my 32 yr old daughter was a baby, and I remember that smell. It wasn’t over powering but it was there. Stan didn’t notice it. The chips and salsa were o.k. the salsa had a little sweetness at first bite. That was to lull you into a false sense of mildness. The heat crept up your throat at the same time the spices wafted up the back of your nose. It would have been good but the sweetness was off putting. I ordered a combination plate that consisted of a beef taco, an enchilada, I opted for a cheese one, and a chile relleno served with rice and beans. I had no intention of eating the whole thing but I thought this would give me a good cross sampling of their dishes. The taco was made of ground beef, I should have asked. Ground beef tacos are o.k. and this one was well seasoned and quite tasty. When I ordered I did ask if they use Mexican style cheese and she said no, just cheddar. I asked that they go easy on the cheese. 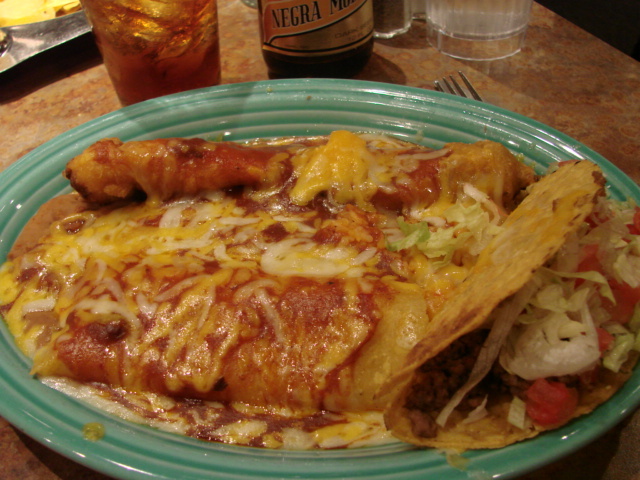 I only took a bite or two of the cheese enchilada, it was just o.k. Here comes the clinker. 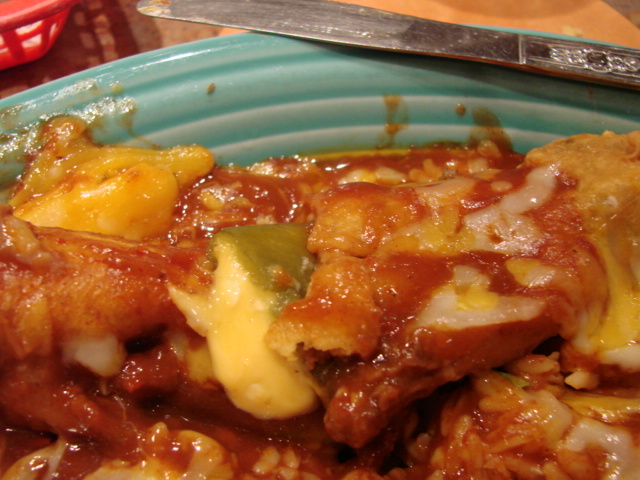 The chile relleno was made with Cheeze Whiz. I absolutely freakin’ kid you not. It took a couple of bites before it to hit me. I opened up the relleno and scooped out the cheese and tasted it alone, I was right. Good thing I cut the Chile relleno in half and photographed it before I ate it. I should have noticed it right away. Can you see the difference in the cheeses here? The rice was barely adequate but the beans were very good. The enchilada sauce was outstanding. I wish I would have paid closer attention to the sauce so I could describe it. I guess I was pre-occupied with Cheez Whiz. 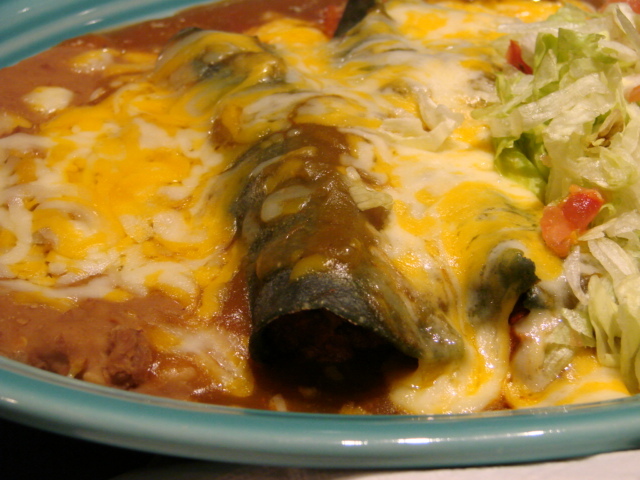 Stan had the blue corn cheese enchiladas served with a pork dish I can't remember now what it was. He said the meat was not pork but chicken and the meal was just o.k. 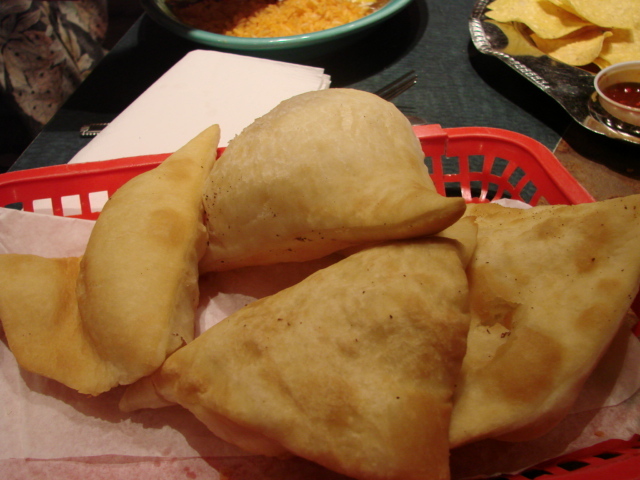 Typical New Mexico sopapillas were served with the meal. They are wonderful little pillows with the perfect pockets to hold the honey before it drizzles out with the first bite. I remember the sopapilllas being brought to the table closer toward the end of the meal so they’d still be hot when eaten. These were brought when our meal was served, so they sat there throughout the meal becoming cooler and cooler. I’m wondering now if they were even hot when served. That’s o.k. this was the only thing we doggie bagged. They aren’t too bad plain with after dinner drinks. 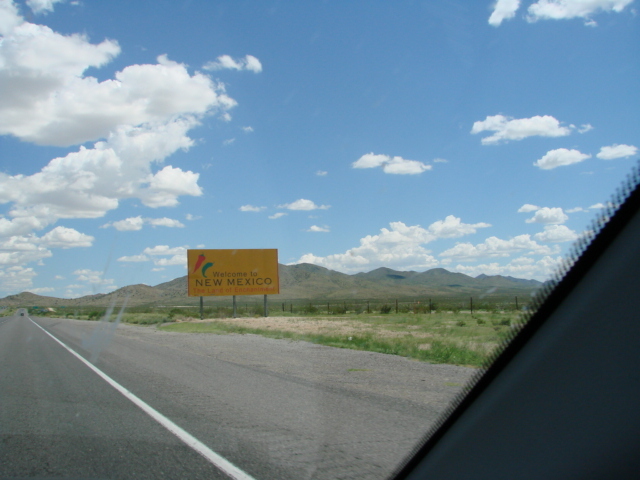 This is the second installment on our road trip to Albuquerque for a cookin' see part one Foodie Road Trip Yahoo!! 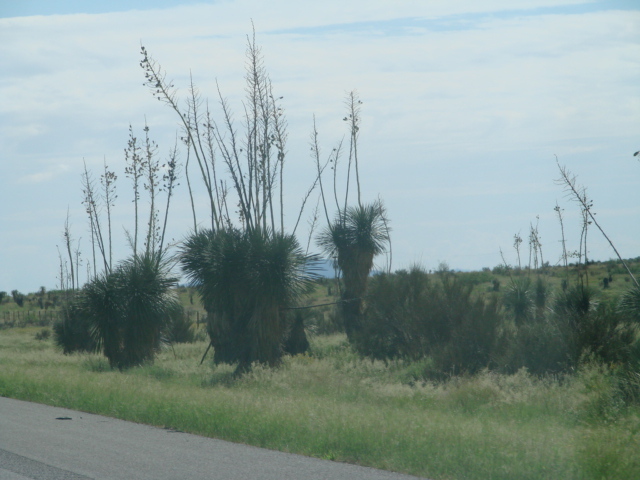 We are on the road on our way to Christine’s for the cooking this weekend.We are in Lordsburg, New Mexico right now. We left at 4:30 this morning. We rented a car for the trip. Our car, that we affectionately call Daisy, has 124 thousand miles on her so we are treating her gently.Daisy doesn’t have an alarm system, but our rental does, can you tell where I’m going? Soooo…4:00 Stan’s taking “stuff” out to the car, 4:01 beep..beep..dweeeeep…dweeeeepppp. dooooingggg.. twip..twip...twip.. that was from the car.. #$%%%^^…. *%%#@ that was from Stan. Good thing we don’t have close neighbors. Alarm figured out, we were on our way at 4:30 as planned. Well, actually. 4:28. We are having a very good trip with good weather. We stopped in Yuma to get some ice and snacks for the road. 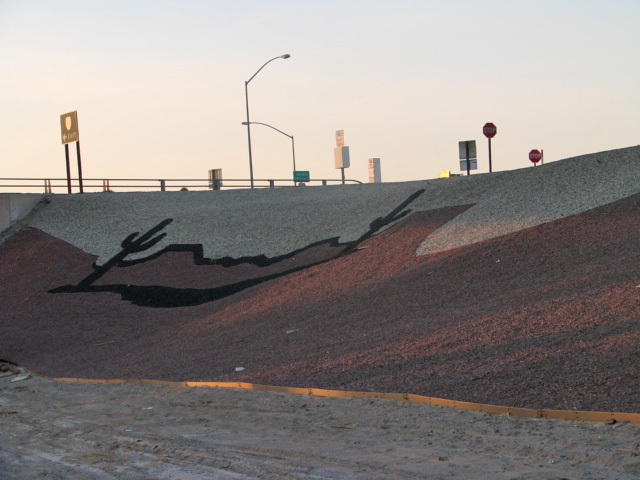 Arizona is doing some nice things with their off ramps. 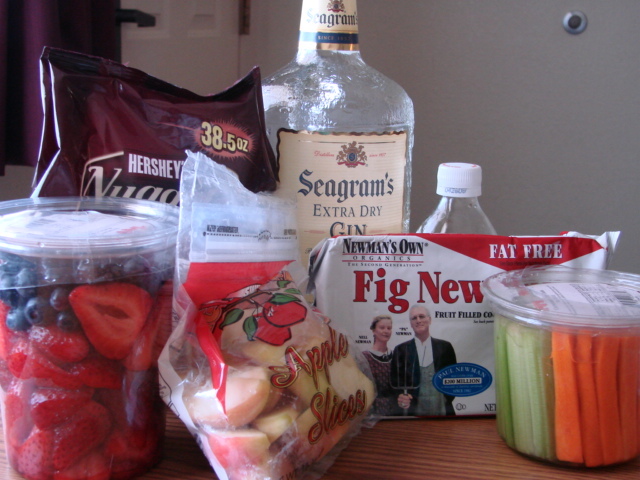 Here are our roadie snacks, the G&T didn’t come out until we hit the motel. I forgot to put the pretzels in the photo. 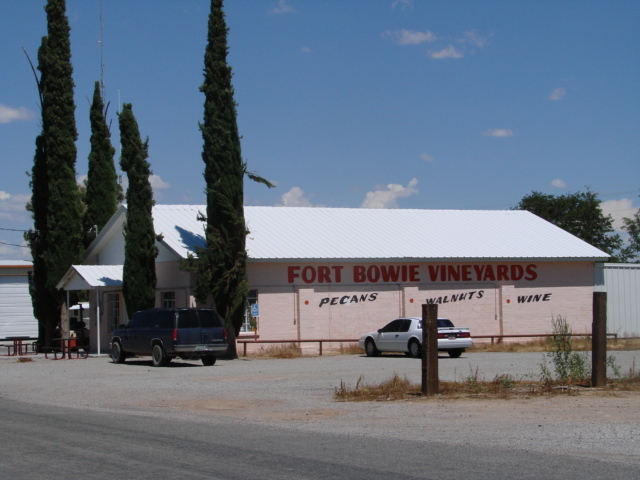 Wayyyyy on the other side of AZ, almost to New Mexico is a little town called Bowie. Actually, we were looking for a restroom for me and we were lucky enough to take this exit. The restroom took a second with me when I read the vineyard and pecan road signs as we were approaching the town. Thankfully the vineyard had a restroom. 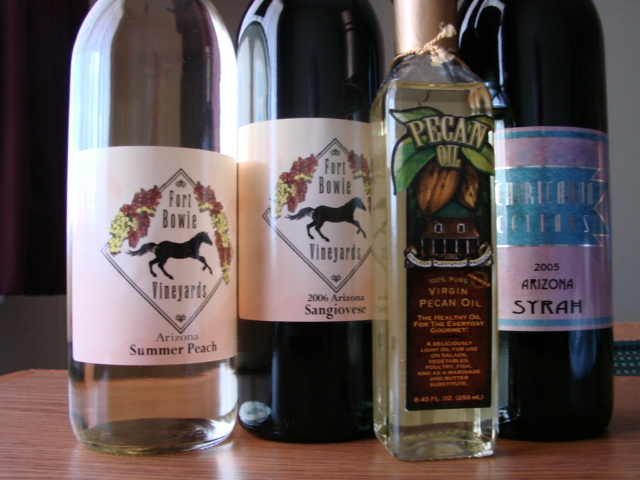 The Sangiovese “Has a strawberry aroma and nice acidity. Pair with ham, stuffed tomatoes or Mediterranean fare.”. 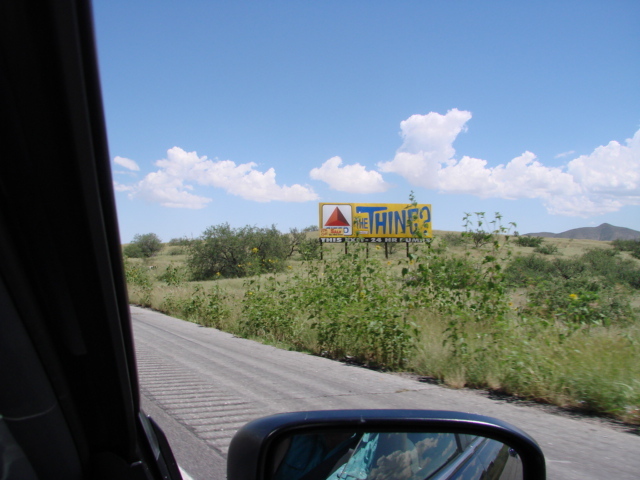 We saw some beautiful scenery and miles, and miles, of trying to be enticed into seeing “The Thing” I’ll pass thankyouverymuch. We had a nice welcome to New Mexico. Thanks, It’s nice to be back. We pulled into the motel and checked in at 1:45 p.m. There is a nice grassy area outside the office. 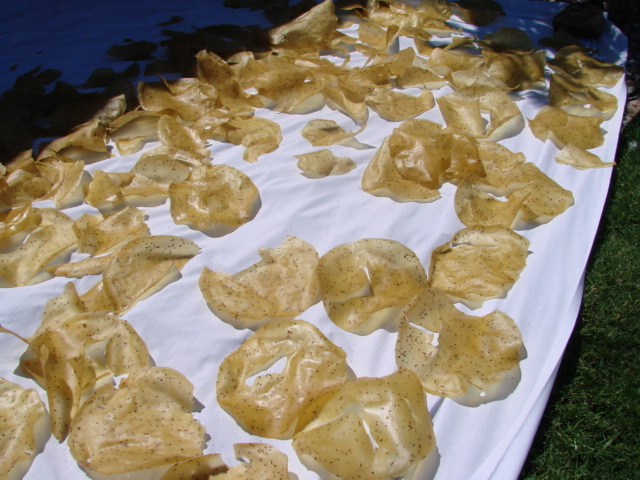 On the lawn was a sheet laid out with what resembled tortillas. 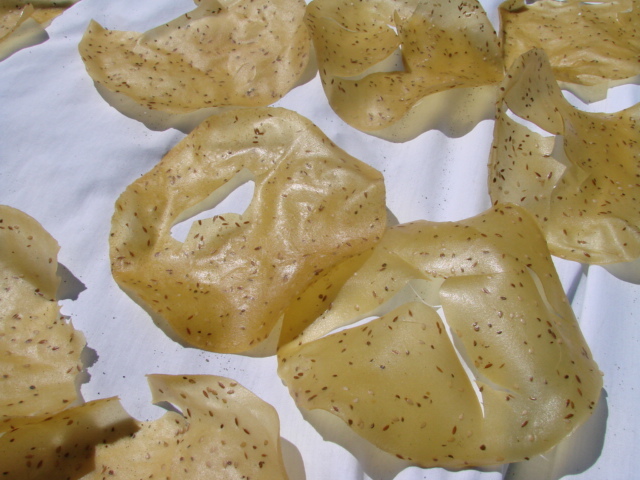 I found out it is called papdi or Khichiya. My curiosity and needing ice for my gin and tonic sent me right back, with my camera of course to check this out. The owners of the Motel are a family from India. Yahoo!! I was hoping to learn something new. As I approached the sheet the older gentleman of the family greeted me, even with a little language barrier we were able to communicate as to what was on the sheet, what it was made of etc…. he was very tolerant of my many questions and offered me some (looks like my hints weren’t too subtle) but said it had to be cooked first. Jagouti came out and picked up a couple of nice pieces for me. She said it would be a while because it had to be grilled. I took my ice back to our room and went back to the office expecting to wait in the lobby. Jagouti came out and asked me to come into the back room with her. This turned out to be their private residence. Believe me, I felt very honored. 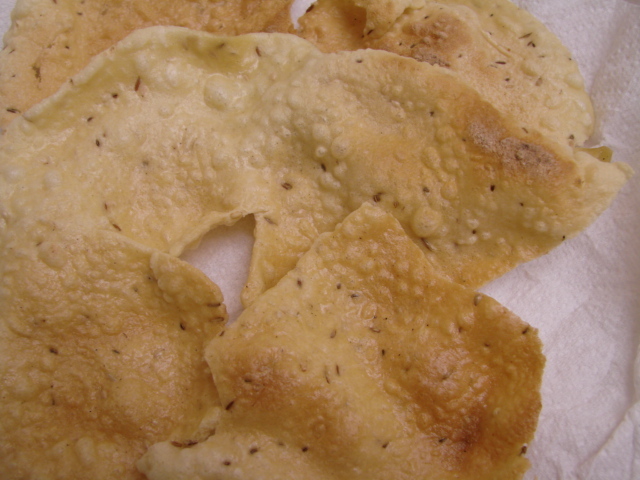 In the kitchen was the older woman of the family at the stove with a grill over the burner cooking the Papdi. It would puff up and brown as she turned it and flipped it on the grill and pressed on it with her tongs. My nostrils filled with the aromas of exotic spices of another land. Jagouti opened a side drawer and showed me the spices used in making the papdi. It takes a special baking powder just for this. They also shared with me some Indian candy that they have to mail order. I didn't take my camera back with me, not knowing I would be so honored. Perhaps it was best, I wouldn't want to intrude too much. The delicate papdi now safely wrapped in paper towels inside a plastic bag was quickly rushed to the room to be shared with Stan. It is very, very, spicy and has cumin. We made the mistake of going to the Flying J Truck Stop for dinner. You have to have the Truck Stop experience once in a while. This should do it for me forever. Blech!!!. is all I'm going to say. We are getting ready for a road trip. We haven’t been on a vacation in 12 years. 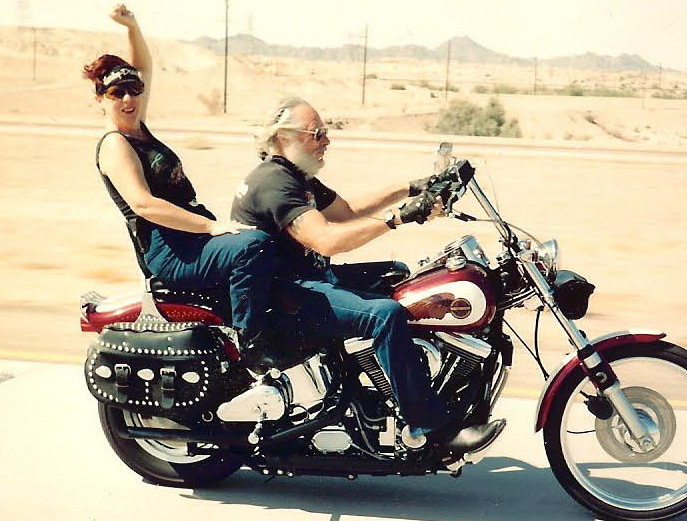 Our last vacation was a trip on our Harley to Sturgis, South Dakota for bike week. This photo is a few pounds and hair colors ago. 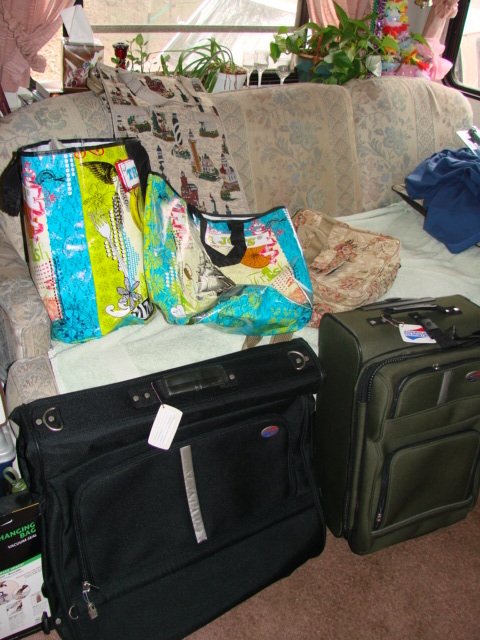 I dug our suitcases and bags out so I could start packing today. As you can tell, we are not experienced world travelers. The only matching bags I have are Trader Joe’s grocery bags, but dang, are they nice bags. One of the participants on rec.food.cooking a cooking group I participate in on Usenet is hosting a cookin' over Labor Day Weekend. Cookins’ started years ago. Over a period of time people in the group discovered that they lived close to each other and started getting together at each other's homes to cook, and it just grew from there. We’ve had people fly in from all over the United States and foreign countries to participate in cookins’. Any number of people participate in these, some are small gatherings, and some are larger. It doesn’t matter the size of the group, it’s the getting together, and meeting each other and eat, eat, eat, oh yeah, and drink, drink, that makes them so much fun. The gal that's hosting this one, came to a couple of cookin's we've had here in San Diego while she was living in Northern California. She has since moved to New Mexico, and was gracious enough to offer to host a cookin' at her new place. Last year she set it up for over Labor Day Weekend. I have been looking forward to this trip for a year. Albuquerque is about a 14 hour drive, but we are going to take two days. I want to take my time, see the sights, and dink around along the way. 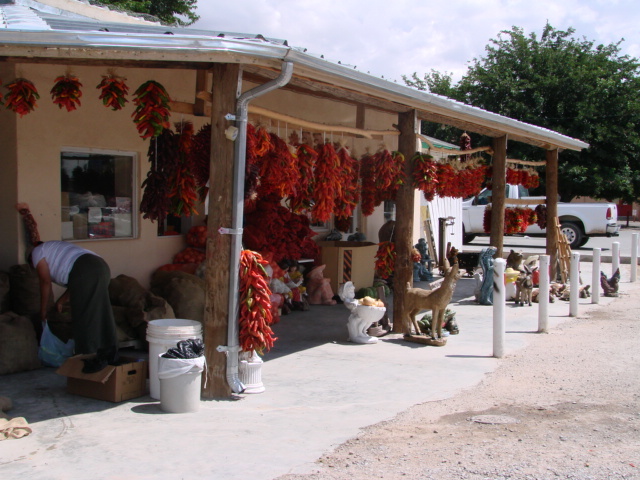 I want to stop in Hatch, New Mexico the chili capitol of the world, its chili time and a lot is going on. We’ll be taking the southern route, I know, boring and hot, but anyone can go through the fabulous towns of Phoenix and Flagstaff. 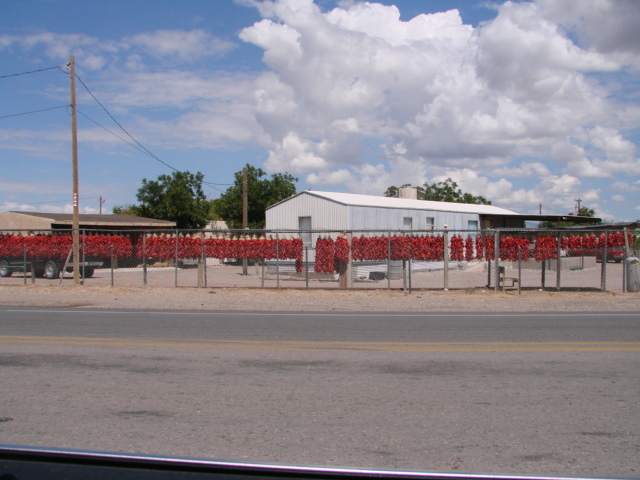 Who do you know that plans trips to Lordsburg and Hatch, New Mexico . We are leaving on Wed the 29th. I have the whole next week off and I’m using it up. After the cookin’ we will be going up to Santa Fe for a couple of days before we leave New Mexico. We’ll go back the Northern route and stop and see the kids and grandkids in Lake Havasu City, AZ. on our way home. I made sure I booked rooms with high speed internet so, be warned, I’ll be adding to this as the days go on. 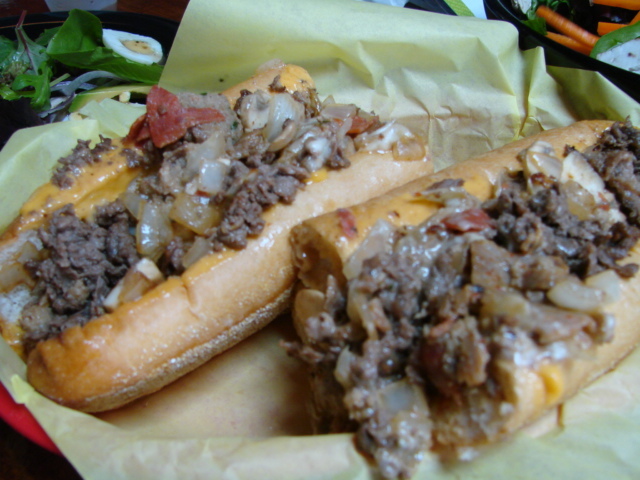 Not only do I have to (please note "have to") try several versions of the Philly Cheese steak sandwich, I also have to try an Italian restaurant in the Gaslamp District that a fellow foodie, in a different country thought sounded close to what you'd find in Italy. This is very high on my list of have to do. 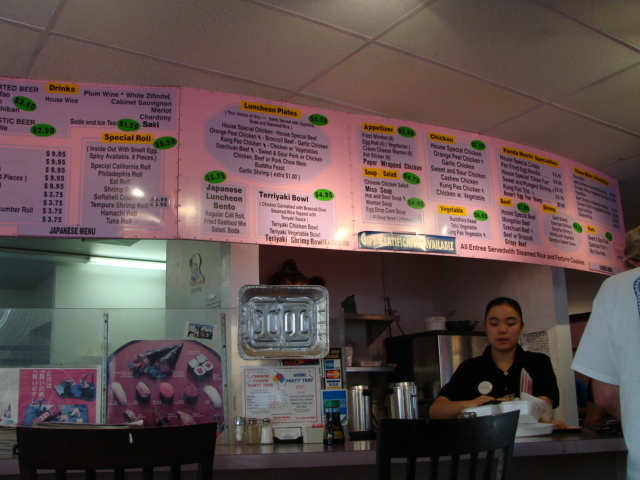 I have to revisit DZ Akins Deli. I have to expand my Sushi repertoire. I'm sure I'm missing a few more but right now I can't think of them. Today I added to the list, I have to find good Pad Thai. I've never had Pad Thai before and have heard nothing but rave reviews about it. I've been wanting to try it for the longest time and today I saw it on the menu of a Chinese restaurant. It just jumped out at me from the menu. Should I have known better than to order a Thai dish in a Chinese restaurant! I did it anyway and am I sorry. I've read the ingredients in the recipes, and it has the things I really like, so how could I not like the completed dish. My first observation was that is was non-de script except for the level of spice. It was spicy enough without being overdone but the flavors under the spicy-ness were muddied, that's the only word I can think of. Nothing seemed to blend well and I couldn't even distinguish any of the ingredients. And there definitely, positively, absolutely, was not one iota of peanut in that dish, they didn't even wave a peanut over it. 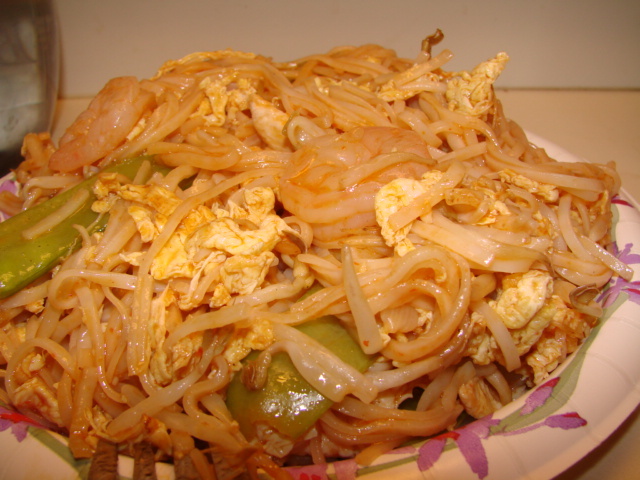 I'm going to try it other places and make it myself before I give up and decide I just don't like Pad Thai. This photo is what I brought home for the raccoons. I put it out for them tonight, if it's still there in the morning I'll let you know. 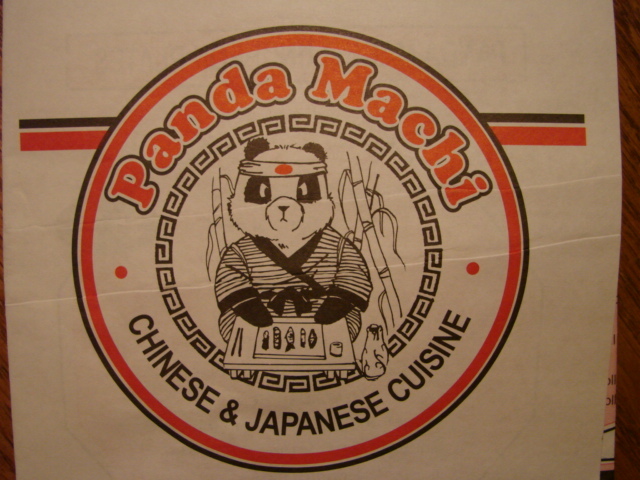 We had dinner tonight at Panda Machi in Alpine. 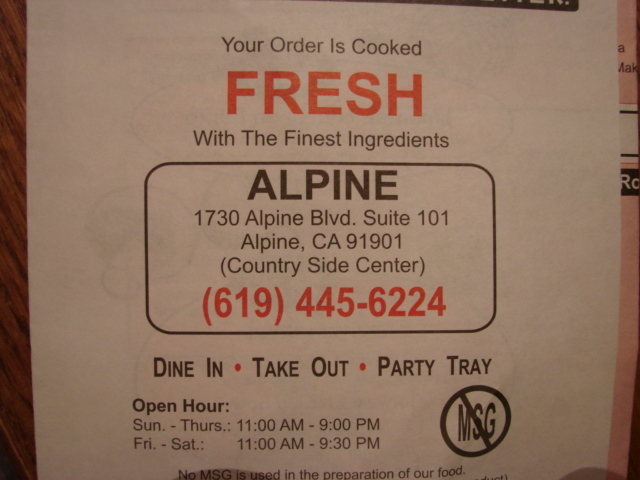 It is a popular Alpine eatery. 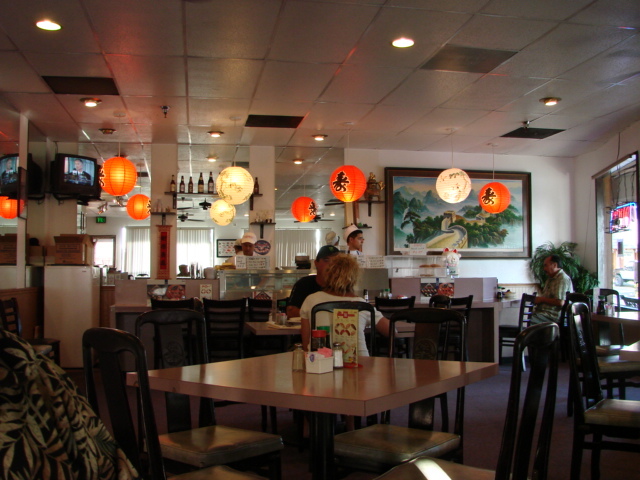 It features both Chinese and Japanese cuisine. We have always had good meals here. This is the restaurant where I first tried Maguro, my favorite sushi, so far. Tonight I started my meal with a side order of Maguro and Unagi. Very good, very fresh. 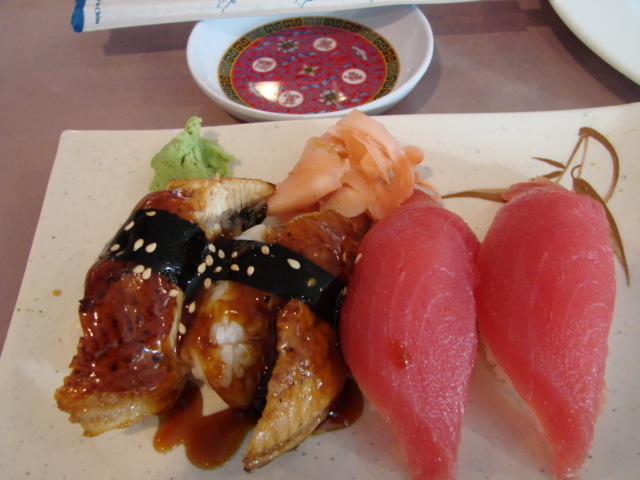 As a sushi "newbie" my first taste of eel was at Sushi Time earlier this month. I'm sooo happy I am venturing out with my sushi experiences. My starters were Japanese so I thought it only appropriate to have Chinese as a main course. 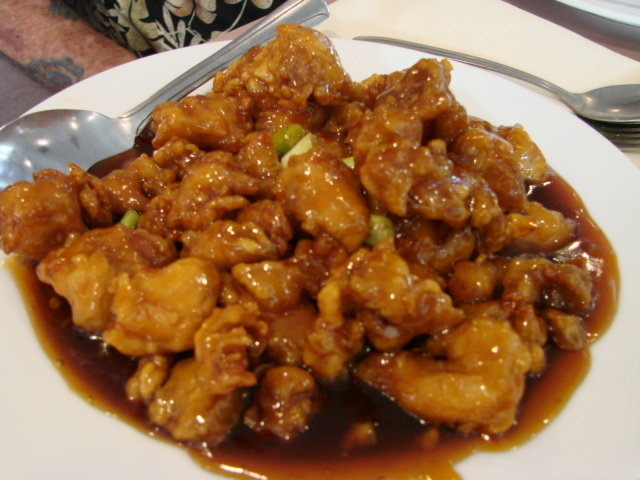 I had the Szechuan Pork. 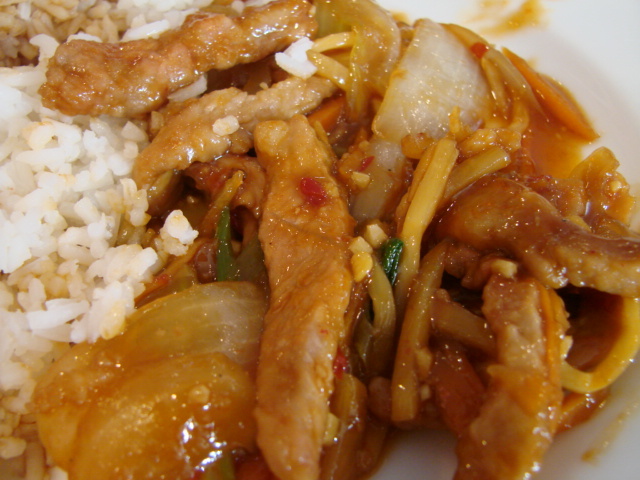 It had pork, bamboo shoot, carrot, and celery combined in a spicy sauce of red pepper and onion. This is one of my favorites. It was pretty spicy, just how I like it. Nice crisp vegetables and a good blending of spices. Stan had his usual Orange Peel Chicken. The menu says it is served in their special spicy sauce. Sometimes it's spicy, sometimes it's not. This the only inconsistency we have seen in some of their dishes. It's a nice little cafe that we know will be good and have great service. I got off easy at the dentist this morning. I was able to have a real lunch after my appointment rather than the Ensure® I was looking forward to. 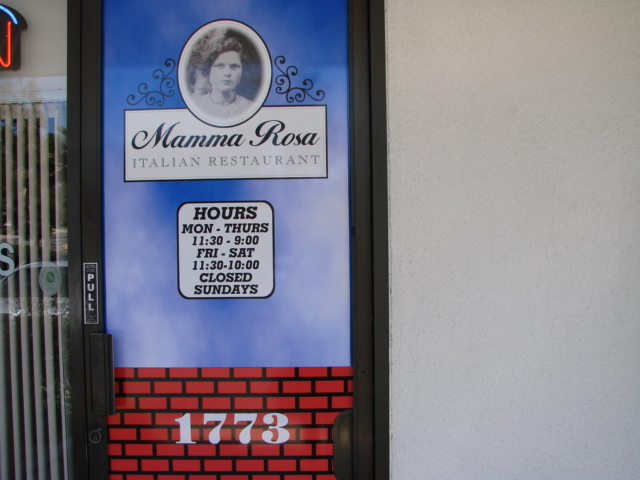 We stopped at Mamma Rosa's on E. Main in El Cajon on our way home. I was hungry for Italian, what exactly I couldn't say, I just wanted something Italian. While I was reading the menu looking for inspiration I was drinking probably the best Iced tea available. It tasted fresh brewed, it was a nice rich color, clear not murky. I had two large glasses of it. I usually can't make it through half a glass of Iced tea anywhere else. I decided on a sausage sandwich with onions, peppers and cheese with a salad. The salad greens were nice and fresh and crisp. I ate the whole thing. Yes I was hungry. By now it was early afternoon and I haven't eaten all day so I gobbled it up. 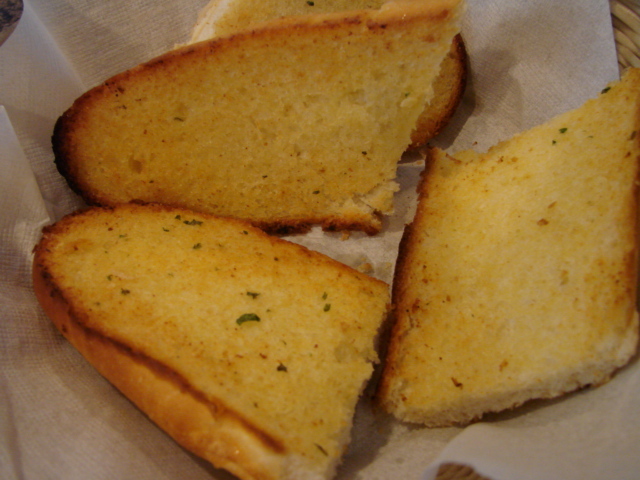 At first sight I thought the garlic bread looked a little weak, more like just a toasted bun. My first bite dispelled that notion, and one whole slice was eaten with the salad. It was nicely toasted and garlicky with a nice crunch. The sausage sandwich was outstanding!!! 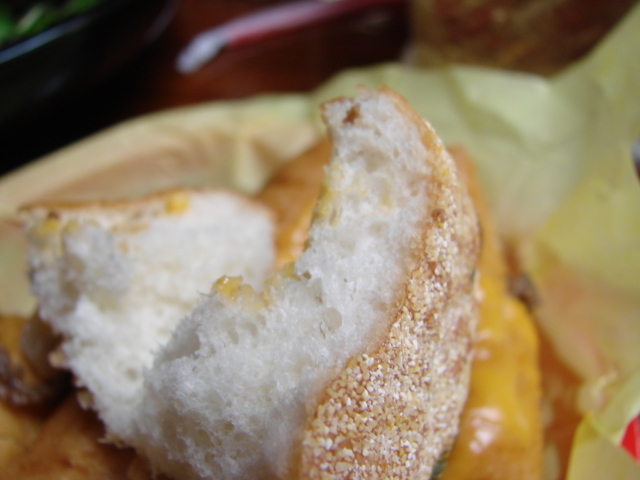 I'm pretty sure the roll was toasted on the grill with a weight on it, it was a little flattened, I liked that. It had body, flavor and crispness and it crunched when bitten into. It held the ingredients tidily without getting soggy. 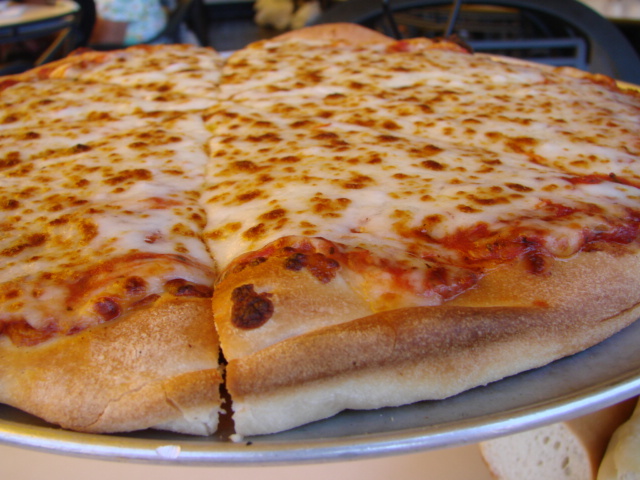 Cheese was put on the inside of the top half of the roll, and put under the broiler, oh, my....hot, nicely browned bubbly cheese. Under this was the sausage and under the sausage was the peppers, onions and more cheese that found it's way from the sandwich to your mouth and back, good and stringy. There was enough marinara sauce to make it moist and juicy without being sloppy. 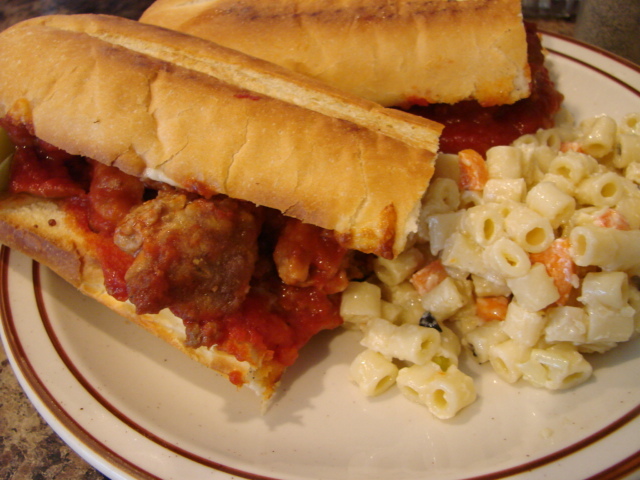 It was served with macaroni salad, another hit. The macaroni was just al dente with a light dressing on it. It was so lightly dressed that I couldn't tell what it was, I'm thinking it was a mayo based dressing. It was so much in the background, a good thing, that you got to taste all the elements of the salad. It had carrots, onion and pickles. Stan had the Rigatoni with meat sauce. The sauce was very good and had a slight sweetness to it, not too much though. It was nice and rich with pieces of fresh basil in it. 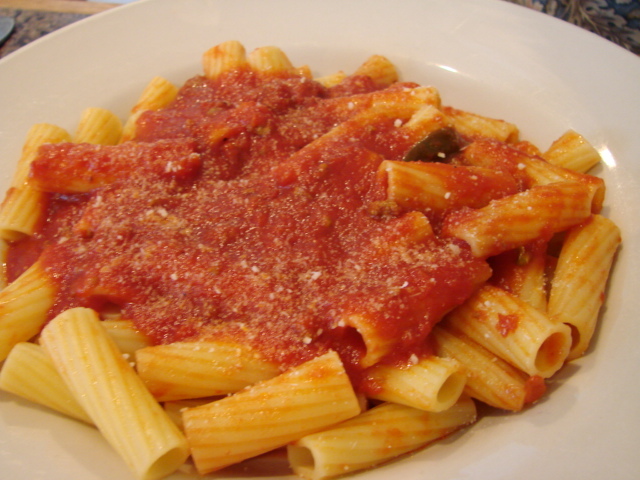 There was just enough sauce to dress the dish and not drown it.The rigatoni was perfect, see how they are not laying flat and mushed, even under the sauce. 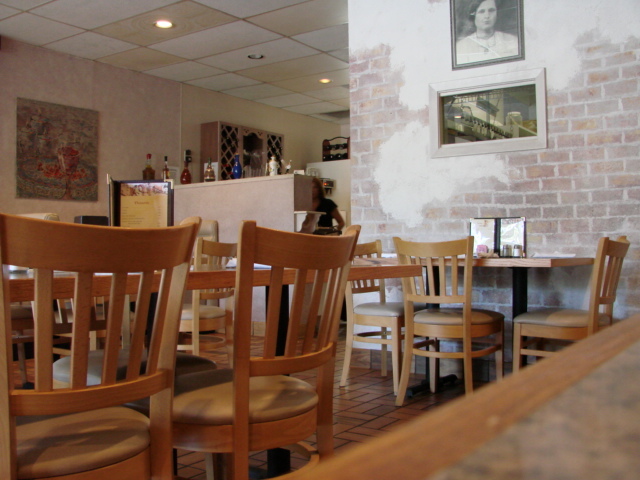 We've been to Mamma Rosa's a couple of other times and every time it's been spotlessly clean. Carol was the waitress today, she was efficient, friendly, and popular with the regulars. Steak Fry at the V.F.W. We try and make it to the local V.F.W. 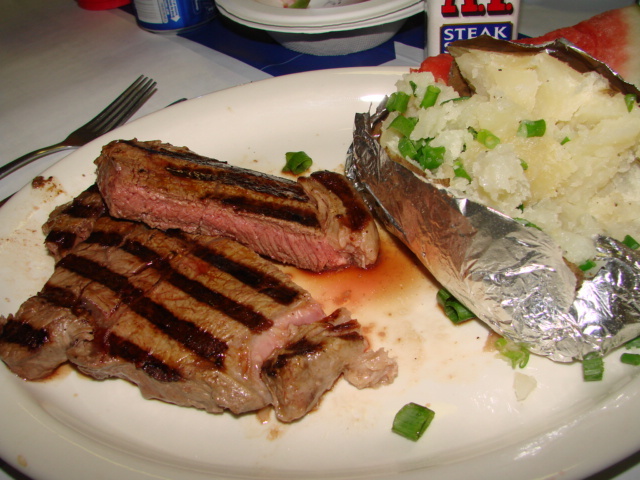 's monthly fund raising steak fry. Thankfully it was on the same day we had the abysmal lunch at Pat & Oscar's so at least the day ended on a positive note. 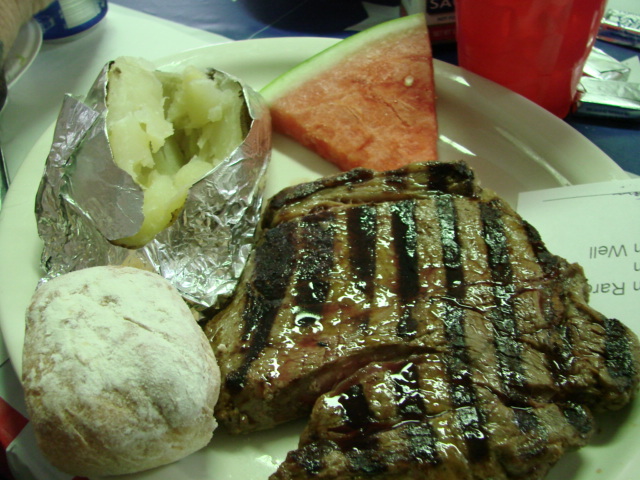 For $16.00 you get salad bar, sirloin steak, baked potato, Ranch Style Beans (the canned one that I love ;-) a dinner roll and a nice piece of fruit on the plate. Yesterday it was watermelon. On the salad bar there is usually a vegetable tray along with the crock pot full of beans. We ordered med-rare. Not too bad for non professionals. No we don't use steak sauce, it just happened to be on the table. The steak was tender and very well seasoned. I'm sure the cook has his own secret blend. We ordered two dinners. One to eat there and one to take home for leftovers, with breakfast in mind. To read about our leftovers breakfast read on. 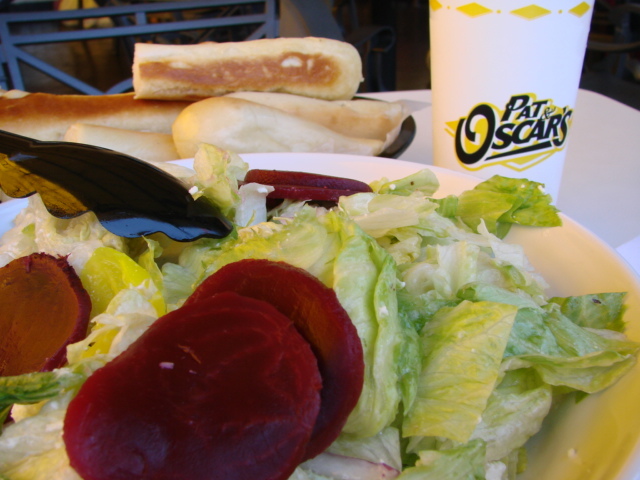 We’ve had lunch at Pat and Oscar’s many times and it’s been consistently good. It’s good for a quick meal on a busy day. We go to the one in Parkway Plaza in El Cajon. It has been a while since we’ve been there so I don’t know if it’s progressively been going down hill or if it was just today, or what, but it was bad! 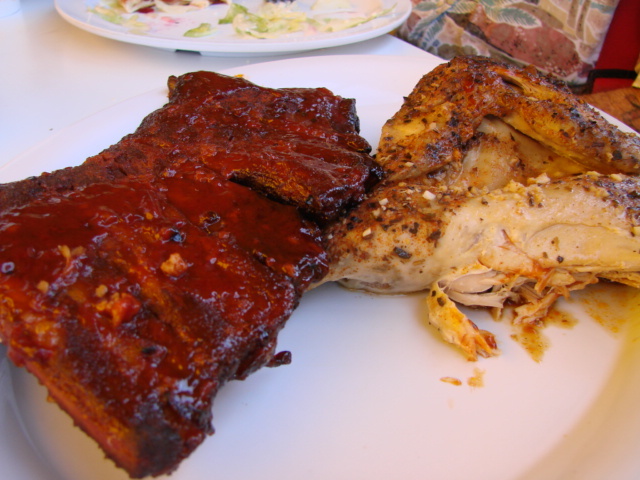 One meal we like to order is the bbq ribs and lemon chicken meal for two with a Greek salad. 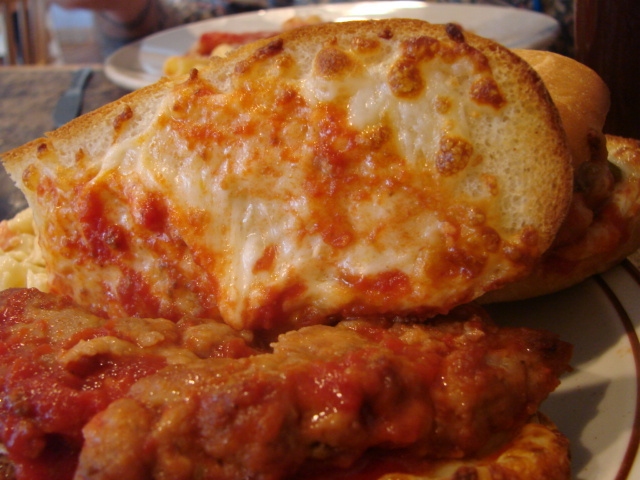 Well, they are running a special, <yahoo> we could have the ribs and chicken meal, and a one topping pizza, we ordered a cheese, for two dollars less than the meal usually costs. What a deal, we could eat a little and take a lot home for snacks. 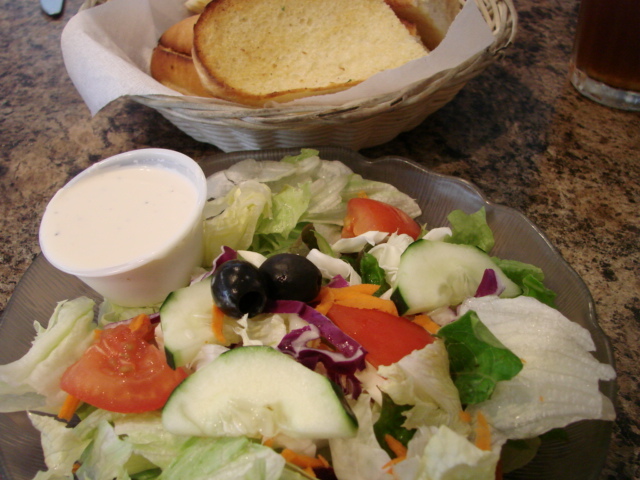 Their salads have been my favorite things they serve. The greens have always been crisp and fresh with a nice amount of added “goodies” and I like their salad dressing. For the most part the salad was fine. This was the first time I ran across some lettuce that looked like it was starting to wilt and was thrown in with some fresher greens. The bread sticks were fantastic as always. 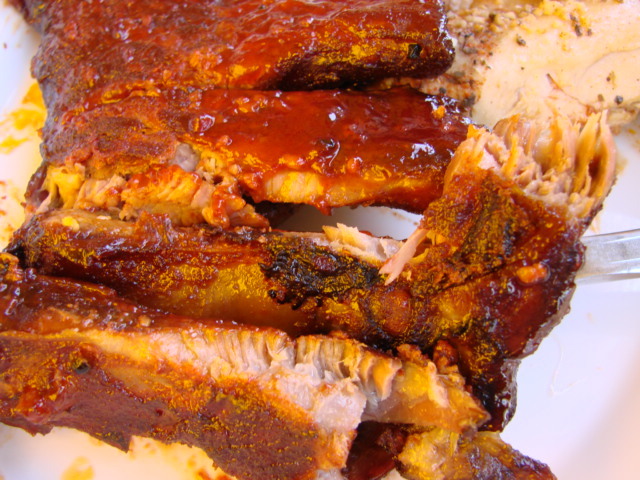 The ribs were overcooked, dry, and appeared to be soaked in a sickeningly sweet bbq sauce then served with more sauce on top. The chicken was adequate, nothing to write about. I have been curious about their pizzas, you know what curiosity got the cat. 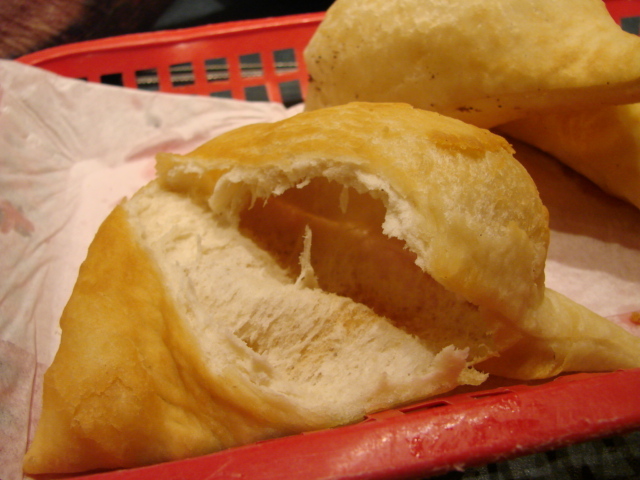 The crust was nice and tasty, toward the outer edge of the crust there was even a little bit of a crunch. That’s it, that was the best part of the pizza. The bottom of the crust was a nice golden brown. I noticed uniform divots on the bottom of the crust so I’m thinking the crusts are mechanically prepared. 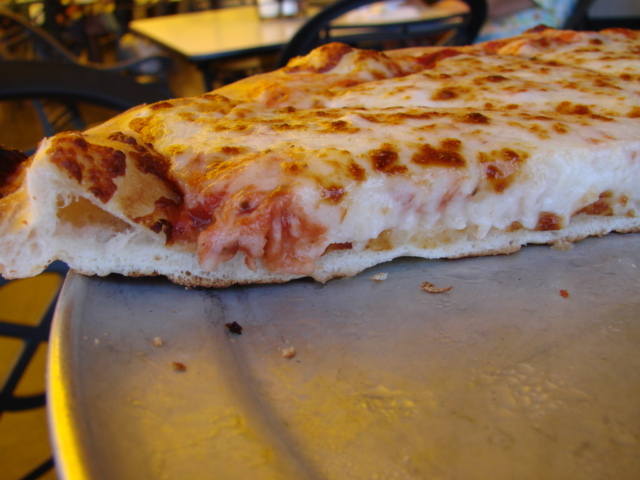 The crust was too soft and lacked body, it couldn't even hold the cheese, it had to be eaten with a fork and knife. Even trying a “foldie” it went limp. It was mooshy on top, yes, mooshy is a food term ;-) The mouth feel was all wrong and the sauce lacked any spices. Needless to say we didn't want doggie bags. I had a chicken leg and thigh, one rib, lots of salad and a half a piece of pizza. Stan had more ribs, no chicken and two pieces of pizza and lots of salad. There was half of the pizza plus one piece left so I offered it to the 4 teenagers that sat at the table next to us, assuring them we only touched what we ate. I know teenage boys, they happily accepted our offer. I think it will be a while before we go back. 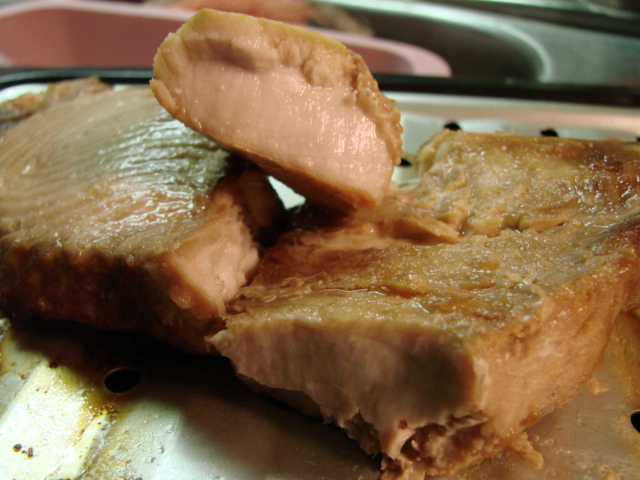 I bought a beautiful shark steak at Sprouts in El Cajon this week. I haven't had shark in a while so I was happily anticipating a delicious dinner. As life would have it, I didn't get to have a shark dinner with all the trimmings, but I needed to cook it last night. I would have preferred to fix it on the grill, but firing up the grill at 9:00 last night was not feasible, (not that I haven't done that before,) so I did the next best thing and broiled it in my trusty little toaster oven. I had it for lunch today and the co-workers I shared it with thought it was pretty good too. 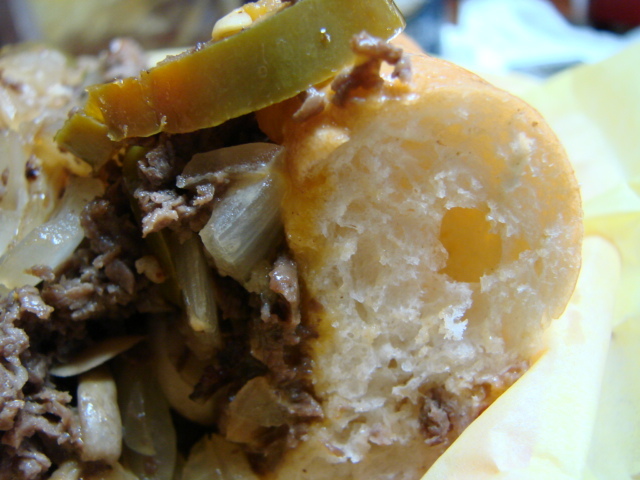 We got to talking about how long it’s been since we’ve had a Philadelphia cheesesteak sandwich. Not knowing where to go I hit up the nice people at chowhound.com for some advice. I got lots of good information. I decided my first trip would be to the Olde City Grill, mainly because of their use of American Kobe beef, and they have the famous Ameroso rolls flown in from Philadelphia. 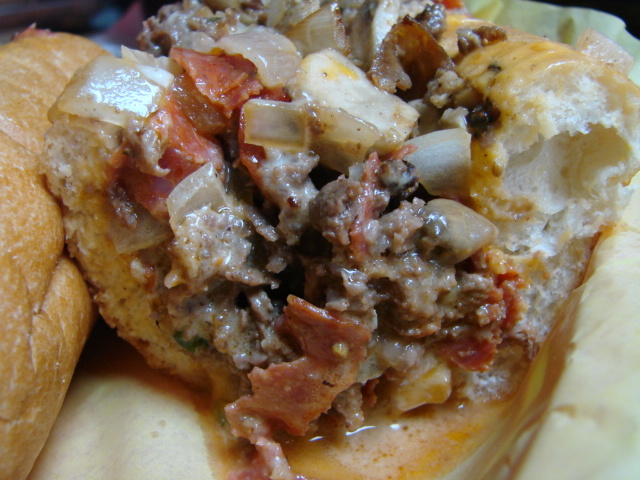 Although they have a variety of delicious looking items on the menu, my focus this trip was on the Philly cheesesteak. We had a salad also, come on, we needed something to make us feel better about stuffing a thousand calories worth of saturated fat into our systems. Doesn’t the salad counter-balance this somehow? 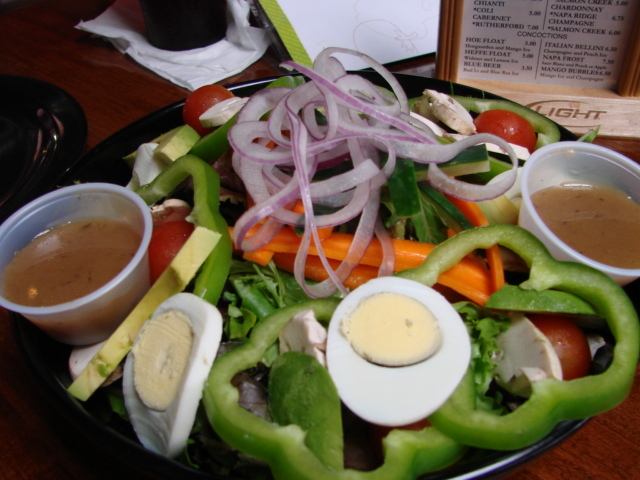 The salad was mixed greens with cherry tomatoes, carrot, cucumber, mushrooms, green bell pepper, avocado, hard boiled egg, thinly sliced red onion with a balsamic vinaigrette dressing. Nice and fresh and a good, good, dressing. My cheesesteak sandwich had, American Kobe beef, cheez “wiz” grilled onion, grilled mushrooms and jalapeño peppers, hot jalapeño peppers. The first thing I did was pinch off the end of the Ameroso roll to taste just the roll. It felt good, had nice body, and it was a beautiful golden color. 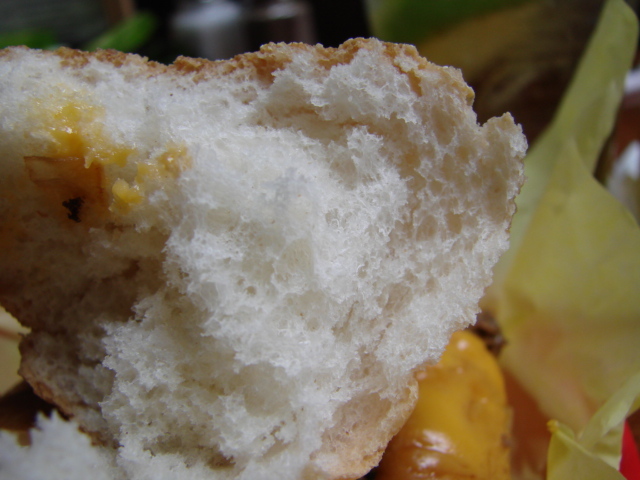 The bottom was a little crunchy and it looked like it had been baked on a stone with fine cornmeal. The flavor is not any thing that would take a way from the ingredients of the sandwich, nor is it anything you would want to eat a ham and cheese on because it is dry, dry, dry. I’m sure it’s made that way for a cheesesteak sandwich, any other bread would not hold up under the cheesesteak ingredients. This bread is definitely for a wet sandwich. The American Kobe beef is fabulous. For the past couple of years I’ve been trying different kinds of beef so I’ve become aware of beef flavors and textures. I always thought beef was beef. I never realized how wrong I was, so I was very anxious to try the American Kobe beef. One of the first words that comes to mind is clean, it’s not murky tasting. Second, mildly beefy. It’s very tender but it still has a nice chew to it. I hope Stan’s stroke Dr. isn’t reading this, if you are, you should be reading the Medical Journal or something, not this. Stan said not one thing over powered the other. It was a good blending of the ingredients and yet you get a taste of each item. It's a long narrow building. There is free customer parking in back of the restaurant. We didn't know that and parked a couple of blocks away. At the beach, you get what you can get. We walked around a little after lunch enjoying the beautiful day near the beach. It was nice to breathe the salt air and we worked off a little of our lunch dodging the bicyclists and skateboarders on the sidewalks. We walked past the nice little trendy beach boutiques that feature clothing for the size two women, who probably have never had a decent Philly cheesesteak in their lives. Pfffttt. 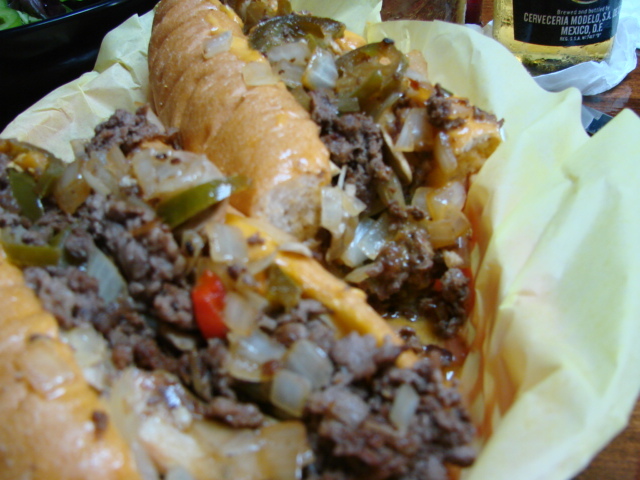 Give me my Philly cheesesteak any day. For a more complete review of the restaurant and their offerings, Captain Jack has a review on his blog. 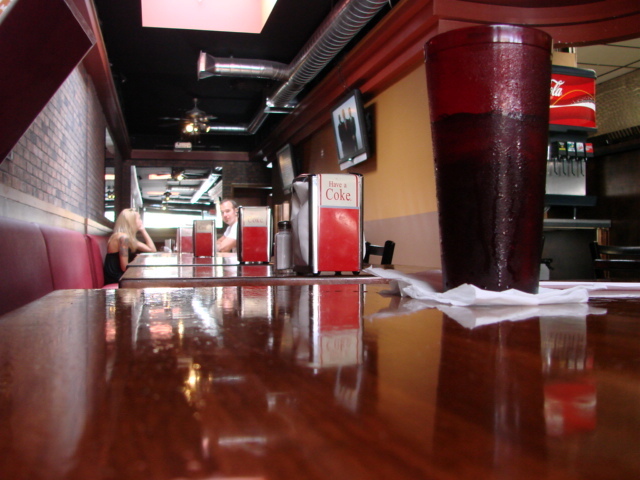 It’s from him and a couple of others at www.Chowhound.com that I learned about Olde City Grill in the first place. 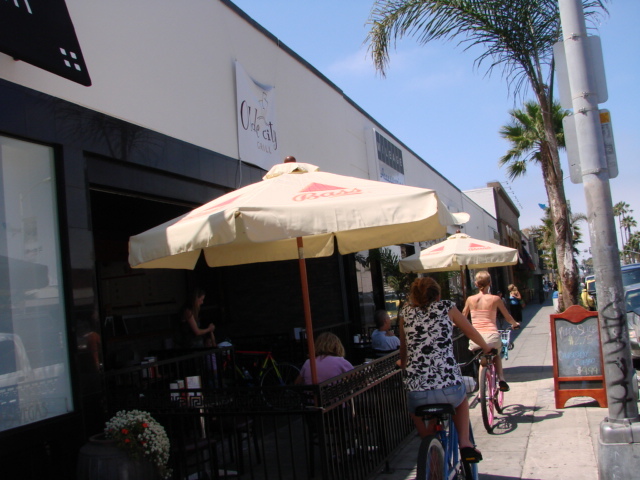 I highly recommend you pop over to Captain Jack’s San Diego Restaruant Review and see what he has to say. He ate a lot more than we did.